Objectives: The purpose of the study was to determine the diagnostic value of computed tomography densitometry in the quantification of hepatosteatosis. Materials and Methods: Fifty-one potential liver donors, ranging in age from 19 to 52 years (mean age: 32.4 years ± 10.2), participated in the study. The mean hepatic attenuation and mean splenic attenuation were determined using regions of interest measurements. The difference between the mean hepatic attenuation and mean splenic attenuation (or liver attenuation index), with liver attenuation index = mean hepatic attenuation – mean splenic attenuation were calculated. Computed tomography densitometric parameters were correlated with histopathologic results. 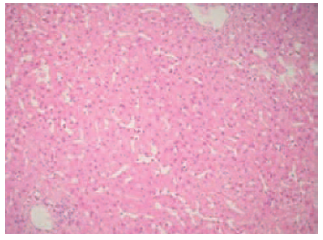 Results: From the histopathologic analysis, the degree of macrovesicular hepatosteatosis was 0% to 8% (mean: 1.1% ± 2%). Seven donors (13.7%) had a degree of macrovesicular steatosis of > 5%, and 12 donors (23.5%) had ≥ 2%. Of the 29 normal donors with histopathologic verification, computed tomo-graphy densitometry predicted ≤ 5% of the hepatosteatosis in 27 donors, and ≤ 2% hepato-steatosis in 2 subjects. 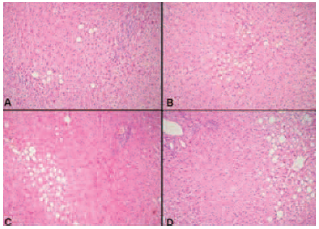 The liver attenuation index was significantly correlated to the histopathologic results. The mathematical relation between liver attenuation index and the degree of histo-pathologic hepatosteatosis was calculated using the least-squares methods, which provided quadratic polynomials. Conclusions: Computed tomography densitometry is a rapid, robust, noninvasive technique for the assessment of hepatosteatosis. 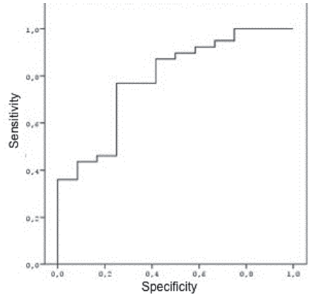 When used in conjunction with clinically stable reference measurements of spleen, the density measurements of liver correctly predicted the presence of fatty infiltration with significant sensitivity (77%) and specificity (75%). This technique, which was refined during the course of our liver transplant program, minimizes the need for highly invasive percutaneous liver biopsies. Nonalcoholic fatty liver disease is described as a micro- and macrovesicular fatty infiltration of hepatocytes, secondary to hepatic damage.1 Although the disease affects approximately 20% of the general population, a higher prevalence has been reported with increasing rates of obesity.1,2 The detection of steatosis is relevant with respect to liver transplant. Additionally, it also is necessary to diagnose and manage metabolic-related disorders, which, if detected early, can be treated; hence, reversing or withholding disease progression. Hepatic steatosis alone can trigger chronic liver disease, as well as cause functional loss in both deceased- and living-donor split liver transplants. In deceased-liver transplant, cold preservation of the transplant graft leads to the fusion and expansion of fats, causing a compression of the sinusoids and hepatocytes, resulting in a circulation disturbance in the sinusoids and graft injury.3 The exposure of the graft to cold is minimized; thus, organs with some degree of steatosis can be used in living-donor liver transplants (LDLT). A moderate degree of steatosis in the liver increases both perioperative morbidity and mortality rates.4 Marcos and associates reported that the functional liver mass decreases by 1% for each percentage of either micro- or macrovesicular hepatic steatosis.5 The use of fatty liver for transplant should be avoided when there is a risk of small-for-size syndrome. Liver biopsy is currently considered the criterion standard for assessing hepatic steatosis. However, every potential donor cannot accept that invasive procedure. Evaluation protocols vary and are dependent on the philosophy of the transplant centers, differing with anthropometric factors. For example, in determining the need for a liver biopsy, Sugawara and associates6 and Miller and associates7 preferred body mass indices of over 25 and 28. However, Ryan and associates8 specified that biopsies should be performed on all potential living-donors, regardless of body mass index. Computed tomography (CT) is commonly used in the qualitative and quantitative evaluation of hepatic steatosis. In the qualitative assessment, hepatic steatosis is estimated based on brightness of the liver and the ability to distinguish vascular structures. Lee and associates9 used a visual grading system comparing the density of vascular structures in the liver and the hepatic parenchymal density with the hepatic attenuation index. They discovered that the visual grading system (qualitative) and the hepatic steatosis index (quantitative) were comparable, with high reliability and similar accuracy levels regarding detection of the hepatic steatosis rate of ≥ 30%. A quantitative evaluation can be performed based on the hepatic attenuation measurement. The density levels measured in Hounsfield units (HU) on noncontrast CT had a reverse linear correlation with the degree of steatosis.10 However, because of patient-to-patient and CT device variations, and variations in cardiac and renal functions in the same patient, the absolute hepatic HU value is thought to be inadequate to diagnose steatosis and its degree of progression. In some studies, the density levels of the liver measured using CT were compared with the values measured from structures, such as the spleen, muscle, and kidney.11-13 The integration of radiologic and histopathologic studies conducted in a large series should reveal the specified association. We aimed to investigate the correlation between the CT densitometry and degree of histopathologically detected steatosis and to develop a mathematical model. One hundred three cases underwent 106 LDLT procedures at the Organ Transplant Center of Inonu University Turgut Ozal Medical Center, Malatya, Turkey, between September 2, 2005, and June 29, 2008. This prospective study was conducted on a total of 51 LDLT donors (19 women and 32 men) who were operated on at this center between December 1, 2007, and May 31, 2008. The mean age of the donors was 34.2 years (SD = 10.2 y; range, 19-52 y). The study was funded by Inonu University Scientific Research Projects Fund under the grant No. I.U. BAP 2005 GUZ-1/GUDUMLU. The study was approved by the Ethical Review Committee of the Institute. All of the protocols conformed to the ethical guidelines of the 1975 Helsinki Declaration. Written informed consent was obtained from all subjects. Computed tomography images were obtained using a multislice CT device with 64 detectors (Aquilion 64, model TSX-101A; Toshiba Medical Corporation, Tochigi, Japan). After obtaining noncontrast images of the liver in a single breath-hold, multiphasic CT angiography images were obtained by administering 81.65-g iomeprol (Iomeron 400, Bracco s. p. a. Milano, Italy), equivalent to 40 grams of iodine in 100 mL of iomeprol, using an automatic injector (Missouri, Ulrich Medical, The Netherlands). Scanning and reconstruction of the noncontrast sections were performed using the following parameters: collimation 0.5 × 64 mm, pitch 0.828, gantry rotation time of 0.5 seconds, 120 kVp, 31 mAs, section thickness of 5 mm, and a reconstruction interval of 5 mm. The images analyzed by single observer (ASK) using the Aquilion VB.10ER004 software. In the noncontrast CT images, 4 slices crossing both liver and spleen, were chosen to measure HU values of liver and spleen. The noncontrast CT images were assessed simultaneously with the contrast-enhanced images to avoid vascular structures, small benign focal lesions and partial volume artifacts (Figure 1). For the liver, 12 separate regions of interest (ROI) were placed in the right lobe and 8 in the left lobe. Mean HU values were recorded for each ROI. The average of the mean HU values of these ROIs was recorded as the MHA. Mean splenic attenuation (MSA) values were also acquired via the placing 10 ROIs, measuring 10 mm2, to the spleen on the same slices with the liver ROIs placed. The liver attenuation index (LAI) was calculated by subtracting the MSA value from the MHA value (MHA – MSA = LAI). A right or left lobe resection was performed to obtain the graft during LDLT operation (Figure 2). After the liver graft from the donor had been removed, a hepatic parenchymal sample was taken from the area on the cut surface, far from the subcapsular region. Because the manipulations performed during the period from resection to placement in formalin may negatively affect evaluating the degree of histo-pathologic steatosis, care was taken to avoid contact between the specimen and the sponge. The specimen was stored in 10% formaldehyde solution until histopathologic evaluation. An experienced pathologist (H. K.) evaluated all specimens. She was blind to the clinically and/or radiologically estimated degree of steatosis. The percentage of hepatocytes with macrovesicular steatosis was determined during the assessment of steatosis (Figures 3 and 4). For the evaluation of steatosis, the nonalcoholic fatty liver disease/-nonalcoholic steatohepatitis histopathologic grading system of Kleiner was used.14 However, in the cases where the steatosis degrees are less than 5%, this grading system is not working. While the aim of this study was to compare the sensitivity of CT densitometry in determining steatosis, to evaluate low degrees of steatosis, we added another grading system. If there was less than 5% of steatosis in the liver, steatotic cells numbered 1000 cells and was determined in 5 different areas and found the mean values and given as steatosis ratio. The degree of steatosis was determined by calculating the mean of the number of hepatocytes (n1, n2, …, n5) with steatosis (n/1000) [where the degree of steatosis (n/1000) = (n1 + n2 +…+ n5) / 5 / 1000]. The calculated value was again converted into a percentage. The zonal distribution of macrosteatosis was recorded, if present. The presence of microvesicular steatosis was not included, because it is clinically insignificant and almost always associated with macrosteatosis. No pathological findings were detected, other than macrosteatosis, in any of the cases. In this prospective study, the accepted histo-pathologic grading system of hepatosteatosis was arranged to compare the CT densitometric and histopathologic results. However, according to histopathologic results the degree of hepatosteatosis varied between 0% and 8%. Hence, for the purpose of evaluating the ability of CT densitometry in detecting of milder degrees of steatosis, cases were grouped according to their degree of steatosis: < 2%, ≥ 2%, < 5%, or ≥ 5%. The Kolmogorov-Smirnov test was used to compare the distribution of the groups and the Kruskal-Wallis test was used to compare multiple independent variables among groups. The specificity and sensitivity values among paired groups were determined using receiver operating characteristic (ROC) curve coordinates. In all statistical tests, P < .05 was accepted as the level of significance. Statistical analyses were performed with SPSS software (SPSS: An IBM Company, version 15.0, IBM Corporation, Armonk, NY, USA). Liver attenuation index values were accepted as x values and histopathologic steatosis degrees were accepted as y. The mathematical relation between these values was expressed as a second-order polynomial and an exponential function, using the least squares method. Based on the histopathologic results, the degree of macrosteatosis of the 51 donor candidates ranged between 0% to 8% (mean, 1.1% ± 2%). Steatosis was not found in 29 cases during histopathologic evaluation. 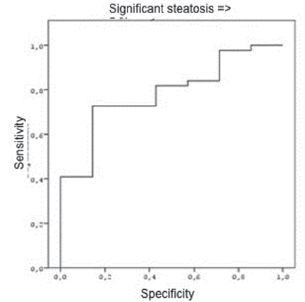 In the evaluation of the CT densitometry of these patients, it was estimated that 27 cases had a steatosis degree of < 5% and 2 cases had a steatosis degree of 5% to 33% (Table 1). Among the 22 cases, only the 7 cases (13.7% of all cases) had ≥ 5% macrosteatosis. The second aim of this study was to develop a mathematical relation that allows for exact degree of macrosteatosis to be estimated by measured values of LAI with CT. For the purpose of this prospect, cases also were preferentially stratified into 2 groups with regard to ≥ 2% and < 2% degree of macrosteatosis. Of the 22 cases, 12 cases (23.5%) had ≥ 2% macrosteatosis. The cases were initially grouped as group 1 and group 2; group 1 corresponded to a steatosis degree of < 2%, and group 2 to a steatosis degree of ≥ 2%. The groups exhibited a normal distribution based on the Kolmogorov-Smirnov test. The Kruskal-Wallis test was used to compare the multiple independent variables of groups 1 and 2 (Table 2), with P < .05 considered as statistically significant. 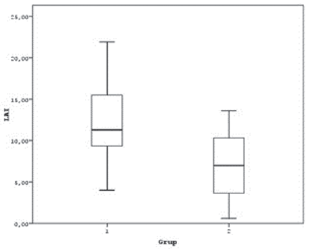 Box plots showing the mean LAI values and standard deviations for groups 1 and 2 were generated (Figure 5). 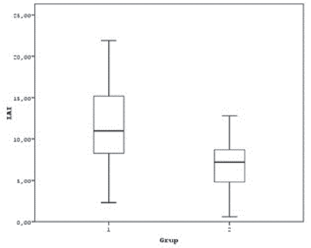 In the second step, cases were grouped as group 1 or group 2, with a percentage of steatosis of < 5% and ≥ 5%. The groups exhibited a normal distribution based on the Kolmogorov-Smirnov test. The Kruskal-Wallis test was used to compare the multiple independent variables of groups 1 and 2 (Table 3); P < .05 was considered statistically significant. Box plots showing the mean LAI values and standard deviations for groups 1 and 2 were generated (Figure 6). Liver attenuation index had the highest level of significance among the assessed parameters in the combined evaluation of Tables 2 and 3. Therefore, ROC curves were created for this parameter. Figure 7 shows the ROC curve for determining < 2% steatosis using LAI. Based on these curve coordinates, when the cutoff value for LAI was 9.1, the sensitivity and specificity of this parameter for identifying < 2% steatosis were 77% and 75%. When the cutoff value considered was 7.2, the sensitivity and specificity of this parameter for identifying < 2% steatosis were 87% and 60%. The ROC curve created to determine < 5% steatosis using LAI is presented in Figure 8. For a cutoff value of 9.1, the sensitivity and specificity of this parameter for identifying < 5% steatosis were 73% and 86%. For a cutoff value of 7.2, the sensitivity and specificity of this parameter were 82% and 67%. In this study, the advantages of CT densitometry for identifying the degree of hepatic steatosis were evaluated. For this purpose, the MHA, MSA, and LAI values, obtained using noncontrast CT images, were compared with the quantitative histopathologic results of hepatic wedge biopsy material obtained during the operation. Unlike many studies that compared preoperative needle biopsy results (fine-needle aspiration biopsy or Tru-Cut biopsy) and the LAI, we used wedged shaped liver tissue taken during the operation. Thereby, hepatic parenchyma specimens were obtained in the desired amount (in an amount greater than that obtained with a needle biopsy) and in a single piece from the region preferred by the pathologist (far from the subcapsular region). In deceased liver transplant, organs with a macrovesicular steatosis degree of > 60% were excluded. However, the presence of microsteatosis does not affect short- or long-term survival.15 In many centers, moderate-to-severe (≥ 30%) macrovesicular steatosis represents an absolute contraindication for LDLT, while a mild degree (< 30%) of steatosis is considered safe.9 Fan and associates16 considered a macrovesicular steatosis level of ≥ 20% as inappropriate for transplant, while some centers used grafts with a steatosis level of < 50%, provided that the residual volume to total liver volume percentage was ≥ 40%.17 However, in LDLT, grafts with moderate-to-severe steatosis may be used in some cases, because of the limited number of donor candidates available per recipient.18 It is well-known that the complication risk proportionally increases with the degree of steatosis increased in LDLT.19 However, high degrees of steatosis, found in a limited number of donor candidates by imaging techniques as false-positive results, and their subsequent exclusion (though they are actually suitable for transplant), is an undesirable event for transplant centers. It is, therefore, crucial to improve the radiologic methods used to determine steatosis and establish their validity. In some centers, percutaneous liver biopsies are performed in all donor candidates to determine the hepatic steatosis level before LDLT.5 Liver biopsies also can investigate any other parenchymal pathology with a subclinical course, such as fibrosis and hepatitis, which represent risk factors for the recipient and the donor. However, this is a highly invasive method. Additionally, a liver biopsy is a painful procedure, which requires bed rest for 6 hours and has a bleeding and mortality risk, although the mortality rate is low.8,20 Liver biopsies performed for histopathologic evaluation are usually taken from the right lobe. Thus, the biopsy results may not reflect the steatosis level of the graft and residual liver in donor candidates with nonho-mogeneous steatosis.1 This can seriously affect the health of the donor. Because of the above-mentioned limitations, noninvasive diagnostic methods, involving the use of clinical, imaging, and/or biochemical parameters have been developed.21,22 Computed tomography examination is one of the noninvasive screening techniques used for the preoperative evaluation of hepatic steatosis in potential donor candidates. The opportunity to evaluate whole liver tissue, including both the graft and the residual part, offers an advantage over biopsy procedures involving sampling from only 1 region (usually the right lobe). Schuchmann and associates1 determined that the degree of steatosis could be estimated numerically using the chemical shift technique on fast spin-echo images. This technique provides acceptable results compared with biopsies, even in cases with a steatosis percentage < 20%. Computed tomography imaging remains a more-sensitive technique compared with other methods, because of the introduction of high-resolution helical techniques.28 Ryan and associates29 used a combination of US and CT and reported that the detection of a steatosis level of ≥ 10% and steatosis level ≥ 30% had an accuracy rate of 65%, and 80%. According to Lee and associates, visual grading (qualitative) and LAI (quantitative) with noncontrast CT have a high rate of accuracy in the diagnostic evaluation of ≥ 30% macrosteatosis in the liver.9 In another study, Raptopoulas and associates30 used a dual-energy CT technique for the calculation of the degree of steatosis, using 80 and 140 kV CT images. When compared to a normal liver, the fatty liver showed a marked decrease in density on the 140-kV images, compared with the 80-kV images.30 Panicek and associates12 compared the liver density measured from a contrast-enhanced CT scan with the densities of the spleen and intercostal or paraspinal muscle groups. They concluded that the method, used to compare the densities of the liver and spleen, was not appropriate for contrast-enhanced CT except in cases with severe steatosis. The measurable HU values of a normal liver range between the 50 to 60 HU. Although these values vary from person to person, there is a constant relation between the densities of the liver and spleen. The density of a normal liver is approximately 5 to 10 HU higher than the spleen. The spleen is an ideal organ as a reference, because it can be evaluated in the same section as the liver, and it is not affected by most metabolic conditions, in contrast to the liver. However, it should be noted that rarely splenic density may change under metastasis, iron accu-mulation, splenic vascular damage, or posttraumatic hypotension conditions. Iwasaki and associates18 stated that the degree of steatosis could be estimated by calculating the ratio of the liver attenuation value (L) to the spleen attenuation value measured on noncontrast images (S); a L/S ratio of ≤ 1.1 had 83% sensitivity and 82% specificity in the determination of the steatosis degree of ≥ 30%. Duman and associates31 determined that the difference between the MSA and MHA on noncontrast CT images correlated to the degree of histopathologic steatosis in all cases, with or without iron accumulation, in nonalcoholic fatty liver disease. Kodama and associates27 compared the mean attenuation value with the histopathologic results in cases that underwent liver resection because of metastatic disease, and concluded that the measurement of the hepatic attenuation value on noncontrast CT images is the optimum method of estimating the degree of steatosis. Park and associates32 used 3 indices, including the ratio of the liver attenuation value (L) to splenic attenuation value (S) (= L / S), the difference between the mean hepatic attenuation (L) and mean splenic attenuation (S) (= L − S), and hepatic parenchymal attenuation, and reported that all 3 indices were correlated to the histopathologic results. In predicting pathologic fat content, noncontrast CT is more accurate than contrast-enhanced CT.27,33 The hepatic attenuation value is affected by the amount, administration rate, the distribution in circulation, and the time of measurement of the administered contrast medium on contrast-enhanced CT images. In conclusion, the decrease in density caused by steatosis may be masked by the attenuation differences induced by the contrast medium. Therefore, noncontrast slices should definitely be obtained, although this will increase the radiation exposure to the donor. Because the parenchymal density of the liver increases in rare conditions that affect liver parenchyma, the degree of steatosis may be misevaluated. As a result, the degree of steatosis is underestimated and steatosis may be found to be absent, even though it is present. This, in turn, limits the sensitivity of the method in the determination of the degree of steatosis by CT densitometry. However, this can be detected by means of the signal loss caused by the super magnetic agents on the magnetic resonance imaging. Calculation of hepatic steatosis index using CT densitometry is a noninvasive and safe method of determining the degree of hepatic steatosis. Multiphasic CT is routinely used to evaluate the diffuse and focal parenchymal disease, to determine the vascular anatomy, and to perform volumetric measurements in donor candidates before LDLT. Calculation of the hepatic steatosis index during these evaluations is an efficient simple procedure. However, the use of radiation is the only known disadvantage when compared with the alternative method, magnetic resonance imaging. In this context, the decision on which method to use depends on the preferences of the radiologists performing the evaluation, based on their knowledge and experience. This study had several limitations. First, the degree of steatosis of the patients in this study group was < 10%, because the donor candidates whose degree of steatosis was estimated to be high by clinical evaluation were excluded at baseline. Among the 51 cases included in this study, steatosis was not detected in 29 cases (approximately 2/3). This affects the creation of functions that show the association between LAI and the percentage of steatosis. Second, the measurement may be faulty in cases with nonhomogenous steatosis, because only a small portion of the liver can be obtained by liver wedge biopsy. We concluded that CT densitometry could be used in the evaluation of the degree of hepatic parenchymal steatosis, which is one of the main steps in the investigation of donor candidates before LDLT. The mild degrees of steatosis, which are more challenging to detect, also can be accurately determined using this method. Therefore, the painful and time-consuming biopsy procedure, which may cause complications, can be avoided in healthy donor candidates. Mathematical models also are important because they can introduce a more realistic estimation of the degree of steatosis. However, further studies are needed to expand these models that can be easily used in the detection of macrosteatosis. Schuchmann S, Weigel C, Albrecht L, et al. Non-invasive quantification of hepatic fat fraction by fast 1.0, 1.5 and 3.0 T MR imaging. Eur J Radiol. 2007;62(3):416-422. Clark JM, Brancati FL, Diehl AM. Nonalcoholic fatty liver disease. Gastroenterology. 2002;122(6):1649-1657. Shimada M, Fujii M, Morine Y, Imura S, Ikemoto T, Ishibashi H. Living-donor liver transplantation: present status and future perspective. J Med Invest. 2005;52(1-2):22-32. Soejima Y, Shimada M, Suehiro T, et al. 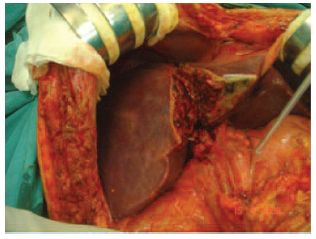 Use of steatotic graft in living-donor liver transplantation. Transplantation. 2003;76(2):344-348. Marcos A. Right lobe living donor liver transplantation: a review. Liver Transpl. 2000;6(1):3-20. Sugawara Y, Makuuchi M. Living donor liver transplantation: present status and recent advances. Br Med Bull. 2006;75-76:15-28. Miller CM, Gondolesi GE, Florman S, et al. One hundred nine living donor liver transplants in adults and children: a single-center experience. Ann Surg. 2001;234(3):301-311; discussion 311-312. Ryan CK, Johnson LA, Germin BI, Marcos A. One hundred consecutive hepatic biopsies in the workup of living donors for right lobe liver transplantation. Liver Transpl. 2002;8(12):1114-1122. Lee SW, Park SH, Kim KW, et al. Unenhanced CT for assessment of macrovesicular hepatic steatosis in living liver donors: comparison of visual grading with liver attenuation index. Radiology. 2007;244(2):479-485. Bydder GM, Chapman RW, Harry D, Bassan L, Sherlock S, Kreel L. Computed tomography attenuation values in fatty liver. J Comput Tomogr. 1981;5(1):33-35. Johnston RJ, Stamm ER, Lewin JM, Hendrick RE, Archer PG. Diagnosis of fatty infiltration of the liver on contrast enhanced CT: limitations of liver-minus-spleen attenuation difference measurements. Abdom Imaging. 1998;23(4):409-415. Panicek DM, Giess CS, Schwartz LH. Qualitative assessment of liver for fatty infiltration on contrast-enhanced CT: is muscle a better standard of reference than spleen? J Comput Assist Tomogr. 1997;21(5):699-705. Lam R, Niessen SJ, Lamb CR. X-ray attenuation of the liver and kidney in cats considered at varying risk of hepatic lipidosis. Vet Radiol Ultrasound. 2014;55(2):141-146. Kleiner DE, Brunt EM, Van Natta M; and the Nonalcoholic Steatohepatitis Clinical Research Network. Design and validation of a histological scoring system for nonalcoholic fatty liver disease. Hepatology. 2005;41(6):1313-1321. Fishbein TM, Fiel MI, Emre S, et al. Use of livers with microvesicular fat safely expands the donor pool. Transplantation. 1997;64(2):248-251. Fan ST, Lo CM, Liu CL, Yong BH, Chan JK, Ng IO. Safety of donors in live donor liver transplantation using right lobe grafts. Arch Surg. 2000;135(3):336-340. Iwasaki M, Takada Y, Hayashi M, et al. Noninvasive evaluation of graft steatosis in living donor liver transplantation. Transplantation. 2004;78(10):1501-1505. Hegab B, Abdelfattah MR, Azzam A, et al. Day-of-surgery rejection of donors in living donor liver transplantation. World J Hepatol. 2012;4(11):299-304. Grant A, Neuberger J. Guidelines on the use of liver biopsy in clinical practice. British Society of Gastroenterology. Gut. 1999;45(suppl 4):IV1-IV11. Ho MC, Lee YH, Jeng YM, Chen CN, Chang KJ, Tsui PH. Relationship between ultrasound backscattered statistics and the concentration of fatty droplets in livers: an animal study. PLoS One. 2013;8(5):e63543. Ricci C, Longo R, Gioulis E, et al. Noninvasive in vivo quantitative assessment of fat content in human liver. J Hepatol. 1997;27(1):108-113. Machann J, Stefan N, Schick F. (1)H MR spectroscopy of skeletal muscle, liver and bone marrow. Eur J Radiol. 2008;67(2):275-284. Lang EM, Lang T, Henne-Bruns D, Kremer B. Ultrasound investigation prior to organ donation. Transplant Proc. 1990;22(2):431-432. Saadeh S, Younossi ZM, Remer EM, et al. The utility of radiological imaging in nonalcoholic fatty liver disease. Gastroenterology. 2002;123(3):745-750. Beavers KL, Semelka RC. MRI evaluation of the liver. Semin Liver Dis. 2001;21(2):161-177. Kodama Y, Ng CS, Wu TT, et al. Comparison of CT methods for determining the fat content of the liver. AJR Am J Roentgenol. 2007;188(5):1307-1312. Kamel IR, Kruskal JB, Raptopoulos V. Imaging for right lobe living donor liver transplantation. Semin Liver Dis. 2001;21(2):271-282. Raptopoulos V, Karellas A, Bernstein J, Reale FR, Constantinou C, Zawacki JK. Value of dual-energy CT in differentiating focal fatty infiltration of the liver from low-density masses. AJR Am J Roentgenol. 1991;157(4):721-725. Duman DG, Celikel C, Tüney D, Imeryüz N, Avsar E, Tözün N. Computed tomography in nonalcoholic fatty liver disease: a useful tool for hepatosteatosis assessment? Dig Dis Sci. 2006;51(2):346-351. Saba L, di Martino M, Bosco S, et al. MDCT classification of steatotic liver: a multicentric analysis. Eur J Gastroenterol Hepatol. 2015;27(3):290-297. Acknowledgements: The authors declare that they have no conflicts of interest to declare.